This year will be hosted by the Carya Golf Club the first and only floodlit course in Turkey and Europe. The Tournament will be played between the 17th & 20th May. The Ladies European Tour is a worldwide organisation with members from more than 40 countries, playing 23 tournaments this year in 23 Australia, New Zealand, China, Morocco, Turkey, Netherlands, England, Scotland, Czech Republic, Sweden, France, Germany, India, South Africa, Japan, Dubai, Spain, & Italy. The Season starts in Australia with the RACV LADIES MASTERS February 12-15. The Turkish Ladies Open at the Carya Golf Club May 17th - 20th will be the 7th. Event of the 2015 season. 126 Lady Professional Players from 32 countries will be competing for the €500,000 prize fund, with a first prize of €80,000. Among the leading players attending will be Dame Laura Davies (Eng.) The winner of more than 80 professional tournaments, and previously the world No.1. Last year’s Champion Valentine Derry (Fra. ), Charley Hull (Eng.) 2014 leading money winner. Lee Anne Pace (S.A.) The winner in 2013. Christal Boeljon (Bel.) winner 2011 & 2012. Melissa Reid (Eng.) The winner 2010. Plus many other leading players Carlotta Ciganda (ESP), Amy Boulden (Wal) last year’s leading Rooky, plus many other big stars of ladies professional golf. It will be preceded on the Saturday 16th. May with a Pro Am Tournament with 36 teams of 3 amateurs. Each team will be joined by one of the leading lady professionals. This event always one of the highlights of the week, brings together many of Turkey’s leading business personalities, along with many of the world’s best Lady professional golfers. Bülent Göktuna, Chairman of Mineks International and the President of National Golf Club, states that is our desire to increase the status of the Turkish Ladies Open to become an even more important event on the fast growing interest in Ladies professional sport. Also increasing Turkey’s Brand Image. We Introduced Ladies Professional Golf To Turkey back in 2008 since we have attracted so many of the world’s best players, raising the status of the sport in Turkey to the level that we are now renowned worldwide as a golfing destination. In addition to doubling this prize fund to €500,000 we are this year finishing the tournament on Wednesday 20th May instead of the traditional Sunday finish, when we are competing with so many other major sporting events for TV coverage. This will give us a massive increase Television exposure worldwide with Live Coverage on Sky Sport and the Golf Channel plus many others. The event will be broadcast to more than 50 countries. Göktuna said that there is a need for many more courses in the Belek region. The 16 existing courses are all full during the season. Our courses are of higher quality than other resort destinations in Europe, we need to build more to cope with the demand. ÖZTÜRK: "The tournament raises the awareness about our country in the international arena." Öztürk says Golf sport is a symbol of stature and quality; it also supports the other products in the destination. It encourages tourists with high level income to travel to Turkey. Golf tourists fly with business class; hotels provide better service and hotel occupancies increases. Therefore, this contributes to the national and regional economy. In this sense; Belek region’s recognition should be increased as an exclusive golf destination and assessment of the broad areas in Antalya for building more golf courses should be done. 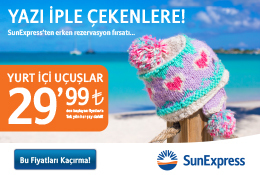 Öztürk added, putting direct flights to Antalya from abroad would help the destination to be more desirable. GÖKTUNA and ÖZTÜRK stated: “We are proud to continue to stage the 7th edition of the Turkish Ladies Open with success and stature. We now intend to further our ambitions and commitment to support Ladies Professional Golf. Our ambition is to host the Solheim Cup 2019 which is the biggest and most prestigious event in ladies golf. We already sent our letter of intent to the Solheim Cup authorities. Turkey has this potential. Many of these children are candidate for Turkish to compete with Turkey for the National Team. 14 of the National Juniors have already represented Turkey in International tournaments. In the Turkish National League 14- 18 age group the National Golf Club Team are The 2014 Champions. Our goal is; to help the children to raise the standards of the girls that competed in LET Access events which is a feeder tour for LET The Aim is to have some of the girls qualified to play in events on the full European Ladies Tour, and hopefully to have at least 1 Turkish Girl competing for a place to represent Europe in the 2019 Solheim Cup. Interest to the Turkish Ladies Open is increasing every year. This contributes significantly to the recognition and love of golf sport in Turkey. The support we receive from our sponsors is essential to the continuation of the tournament. Support given by the sponsor plays an important role to increase the awareness of golf tournaments which creates an international cultural interaction. National Golf Club, established in the year 1994, staged its first Professional Golf Tournament in May 1996. The Turkish Seniors Open (an event on the European Seniors Men’s Tour) this was repeated in 1997. Since then The National has promoted 6 Turkish Ladies Opens 2007-2014. In 2000 the National was selected as the 9th of the top 1500 best course in Europe. Carya Golf Club, opened 2010 is a classic heath land design with similar features to the best inland British courses. The Championship Course hosted The European Challenge Tour in 2012. Peter Thomson 5 times the Open Champion was the designer through his company Thomson Perrett & Lobb Golf Course Architects. Carya Golf Course has recently become the first course in Europe to boast 18 holes fully flood lit for night golf. This has created much interest and is proving a great success.